People living with HIV haven’t been able to donate kidneys until now, because there were worries that HIV was too much of a risk factor for kidney disease in the donor. However, Segev and colleagues’ recent research on over 40,000 people living with HIV showed that the new antiretroviral drugs are safe for the kidney, and that those with well-controlled HIV have basically the same risks as those without HIV and are healthy enough to donate kidneys. 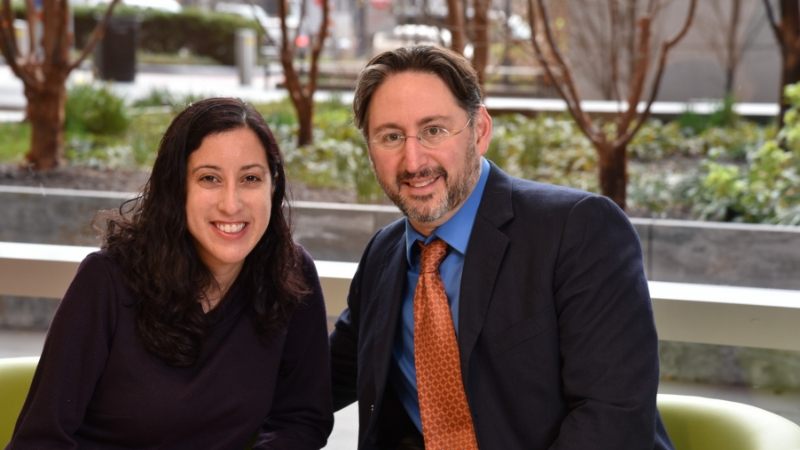 Durand and Segev are leading HOPE in Action, an effort that encompasses multiple national studies exploring the feasibility, safety and effectiveness of HIV-to-HIV transplantation. This innovation was made possible by Segev’s conception of and advocacy for the 2013 federal HIV Organ Policy Equity Act (the HOPE Act). In addition to leading the team that performed the first deceased donor HOPE transplants in the United States in 2016, they are leading two NIH-funded trials of HIV-to-HIV kidney and liver transplants. This first-ever living kidney donor transplant is the next major milestone in HOPE. Nina Martinez, the 35-year-old kidney donor living with HIV, first learned of the HOPE Act at the time of its passage in 2013. Yet, until she saw a storyline on the medical drama Grey’s Anatomy a few months later, she didn’t realize where her own life would intersect with kidney donation. The writers on Grey’s Anatomy created a storyline about the first living kidney donor with HIV, and Martinez saw what her future might hold. Martinez lives in Atlanta and is a public health consultant, clinical research volunteer and policy advocate dedicated to eliminating the stigma still surrounding HIV. In July 2018, Martinez read on Facebook that a friend who also happened to have HIV needed a kidney transplant. Martinez felt compelled to look for a way to bring HOPE to her friend. Familiar with the medical research process and public health policy, she contacted Johns Hopkins. After corresponding with Segev about the possibility of donating, Martinez traveled to Baltimore in October 2018 to undergo an evaluation for potential kidney donation at The Johns Hopkins Hospital. The tests required multiple trips for analysis to be certain that she was healthy enough to donate, which is standard in evaluating potential living kidney donors. But, before she was cleared, her friend passed away. She attended the funeral and considered her options. Martinez, while grieving her friend, decided she was still willing to donate, now to a person she would not know—an anonymous recipient. During their evaluation, the surgical team confirmed Martinez had healthy kidneys and a low viral load, which met criteria required by the HOPE federal safeguards. Once cleared, she successfully donated a kidney to a recipient who wishes to remain anonymous. In a 2018 American Journal of Transplant article, surgeons studied the factors that can identify candidates healthy enough to donate a kidney. Those with well-controlled HIV, who don’t have a history of diabetes, uncontrolled high blood pressure or protein in their urine could be healthy enough to donate. The physicians will continue to closely monitor the recipient and the donor. In light of the new prediction factors and the highly effective antiretroviral therapy options available, the team says they’re optimistic that long-term HIV control and kidney function will be excellent. About 113,000 people are on the transplant waiting list in the United States as of March 2019, according to the United Network for Organ Sharing. Approximately 20 Americans die each day waiting for transplants; the longest transplant waitlist is for a kidney. People living with HIV who volunteer to be living donors could potentially save the lives of thousands of people living with HIV in need of transplants each year. Since Johns Hopkins’ breakthrough transplant in 2016, there have been more than 50 deceased donors under the HOPE Act and over 100 transplant recipients under a HOPE protocol in the U.S. This work is supported by the National Cancer Institute, National Institutes of Allergy and Infectious Disease, National Institutes of Health, Centers for Disease Control and Prevention, and Agency for Healthcare Research and Quality (NCT02602262, NCT03500315, NCT03734393). Could HIV-Infected Organs Save Lives? Durand and Segev are leading HOPE in Action, an effort that encompasses multiple national studies exploring the feasibility, safety and effectiveness of HIV-to-HIV transplantation. This innovation was made possible by Segev’s conception of and advocacy for the 2013 federal HIV Organ Policy Equity Act(the HOPE Act). In addition to leading the team that performed the first deceased donor HOPE transplants in the United States in 2016, they are leading two NIH-funded trials of HIV-to-HIV kidney and liver transplants. This first-ever living kidney donor transplant is the next major milestone in HOPE.